There has been some good discussion and suggestions on the toe pockets that I molded into the hull to serve as a ladder for getting to and from the tender. For reference, the pockets are 10" wide and 4" high. At least that's what the drawing shows. I haven't actually measured them. And the depth is unknown. I asked for them to be as deep as possible without interfering with the interior. My guess is that they are around 4" deep, maybe 6". The discussion has been around grab bars so you have something to hold onto while climbing up and down. 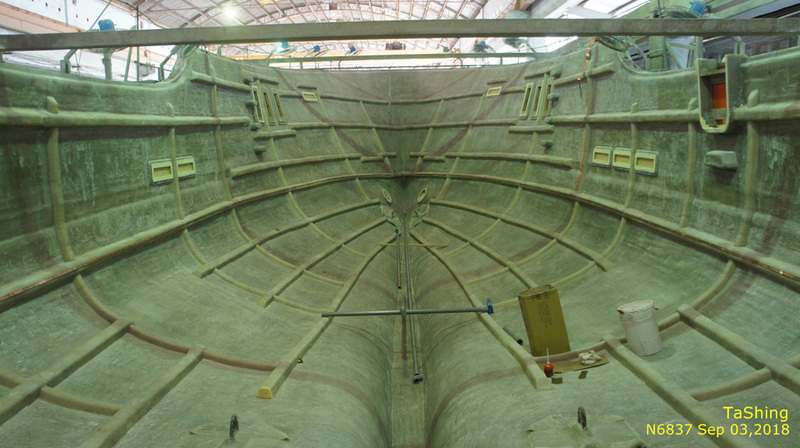 This is particularly important because the hull curves inward a bit as you descend. The picture below shows the most viable options so far. Note that the distance shown by the red arrow from the lowest pocket to the highest possible grab bar location is 5' 3", so not a huge stretch. 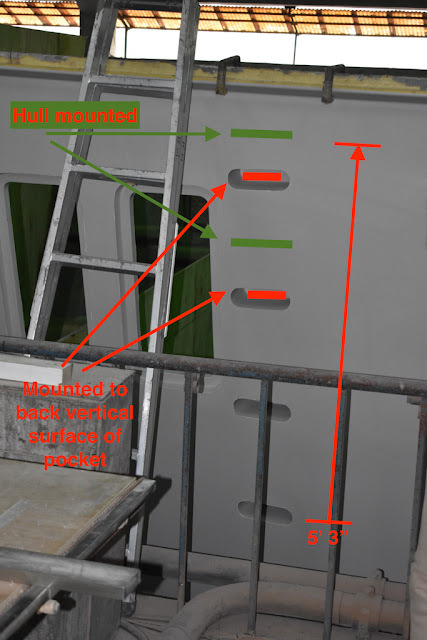 The default solution is one or two grab bars as show in green, mounted to the surface of the hull, roughly midway between pockets. I don't think more than two will be needed, and one might even work. But I'm thinking it would be great if there were a grab bar inside the pocket at the back as shown in red. Then you would reach into the pocket and grab the bar, just like you would grab the rung on a ladder. I think that's where there is most likely to be enough space inside the pocket. But I'm not super optimistic that there will be room. I just don't know how deep the pockets are, and whether there would be enough of a toe hold if there were a grab bar back in there. But it would be great to get the grab bars tucked away. A grab bar could conceptually be attached to the upper inside surface of the pocket, hanging from the ceiling, so to speak. But I'm pretty sure they would interfere with using the pocket as a toe hold. I received a lot of questions about our Scania main engine and the thinking behind the decision, so here goes. First, none of the engine choices we had would have been bad. In fact, all are excellent engines with great reputation, and I wouldn't reject any boat just because it had one of these engines. Quite the opposite. But when faced with a blank (or almost blank) sheet of paper, the engine choice is worth some thought and consideration. We have two engines, but not in the traditional sense of a twin engine boat where both engines are identical. We have a main engine that is the primary propulsion engine, plus an auxiliary engine for hydraulic power for thrusters, windless, pumps, etc.. It also acts as backup propulsion in case of a main engine failure, using it's own drive shaft and a folding sailboat propeller to minimize drag when not in use. It's location is offset to one side of the center line of the boat, and for that reason is typically referred to as a "wing" engine. All this means we need two engines with different specs. The wing engine needs to be around 150 hp, and the main engine around 400 hp, both with continuous duty rating. Duty ratings are worth a little sidebar. 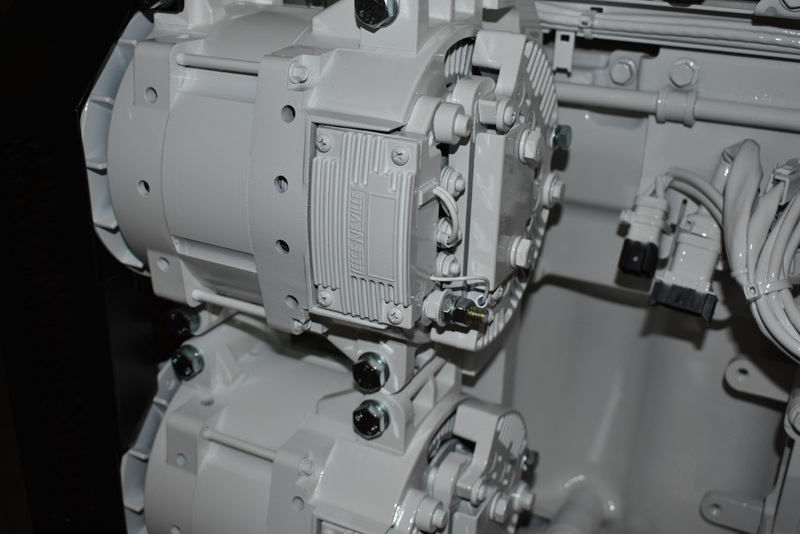 All engines are rated with a maximum horsepower or kw output power. That's always part of the headline. But elsewhere in the fine print are limits on how long you can run the engine at full power, or more specifically what portion of the run time can be at full power vs something less than full power. Think of your car which might have an engine rated for 200 hp. How long do you think it would last if you ran it at full power, peddle to the floor, all the time, never letting up for even a second? Not very long. But that's fine because that's not how we drive. 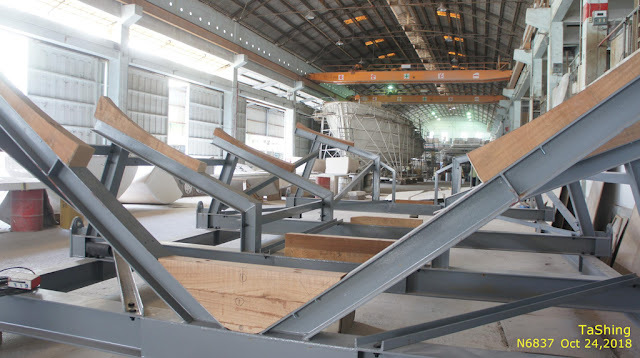 With industrial engines things are different because there are many application where the engine needs to operate at full power for sustained lengths of time. Think about an irrigation pump that might need to pump water continuously, or a ferry that is underway at full power for 3hrs, then at dock for 2 hrs, then underway again... To deal with this, industrial engines all have service ratings to help match them to the application. Every manufacturer uses different terms with different definitions, but conceptually they are all the same. By way of example, here are Deere's so-called "M ratings". M1 - Unlimited full power hours, unlimited hours per year. This is a "continuous duty" rating. 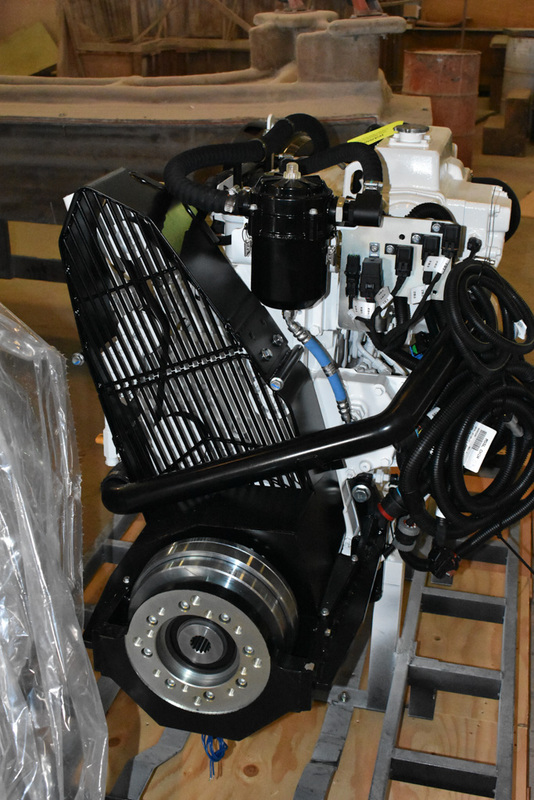 You can start the engine, load it up to full power, and leave it there for it's entire life, save maintenance time. You can put almost 9000 hrs on it and still be under warranty, and continue to clock hours at 9000 per year. M2 - Full power is allowed for 16 out of every 24hrs, and annual hrs are expected to be between 3000-5000. This could run a ferry with two hrs underway at full power, 1 hrs at dock, then repeat for 12hs every day for the life of the engine. M3 - Full power for 4hr out of every 12hrs, and annual hours of between 2000-4000. M4 - Full power for 1hr out of every 12hrs, and 1000 to 3000 annual hours. For many pleasure boats, any of these ratings would be fine, and very few can't be served just fine by an M2 rating. 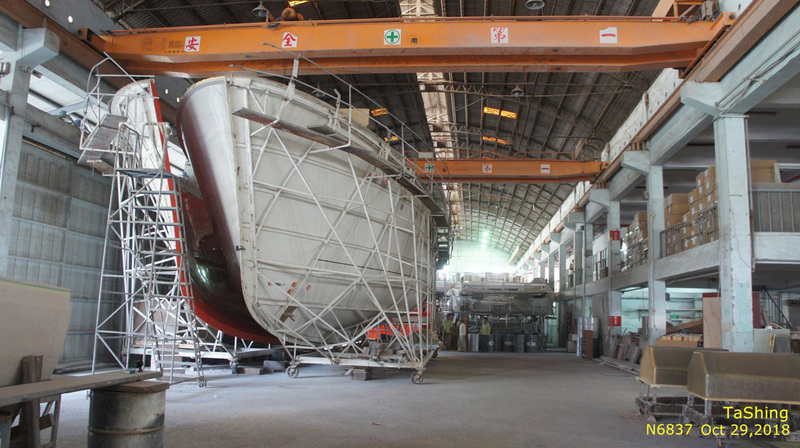 In fact, many Nordhavn's are specified with M2 rated engines. 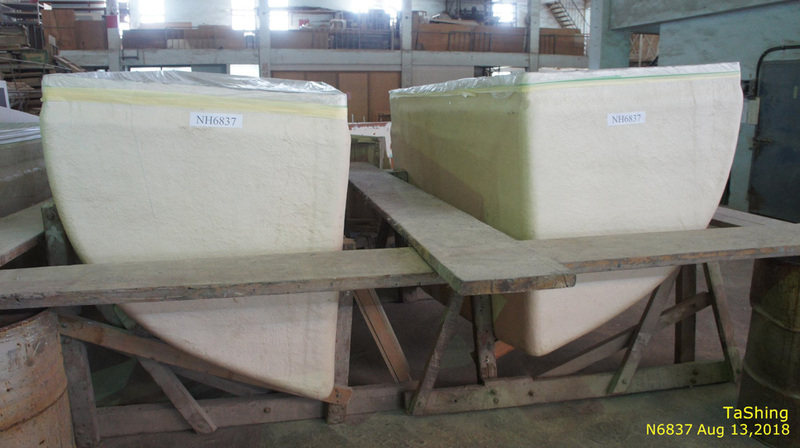 But others, especially if expected to operate wide and far, are specified with M1 rated engines. All this brings us to requirement #1 for the engines: They must be continuous duty rated. 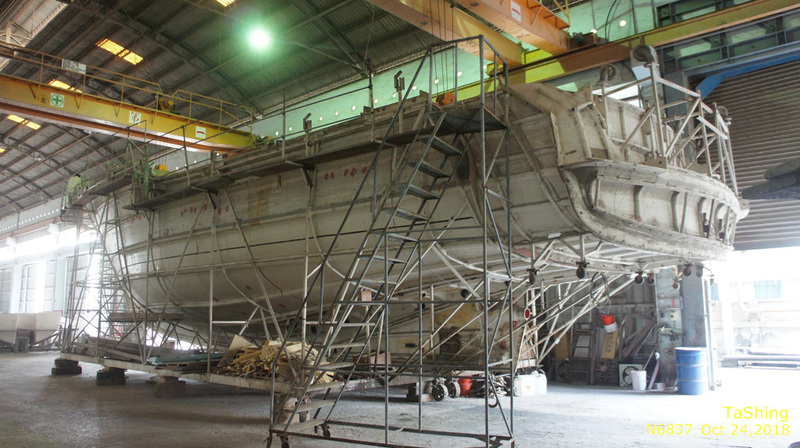 Requirement #2 is that the engine needs to meet US, EU, and IMO emissions requirements. For those in the US, that means Tier 3 which does NOT include special after treatment or catalysts, but is a very clean burning engine. Requirement #3 is that the engine needs to provide the desired power output, 400 hp for the main, and about 150 hp for the wing. Then there is a long list of stuff that I just assume is a given like a reputable manufacturer, parts availability, excellent reputation and service record in marine applications, etc. etc. It's a short list. 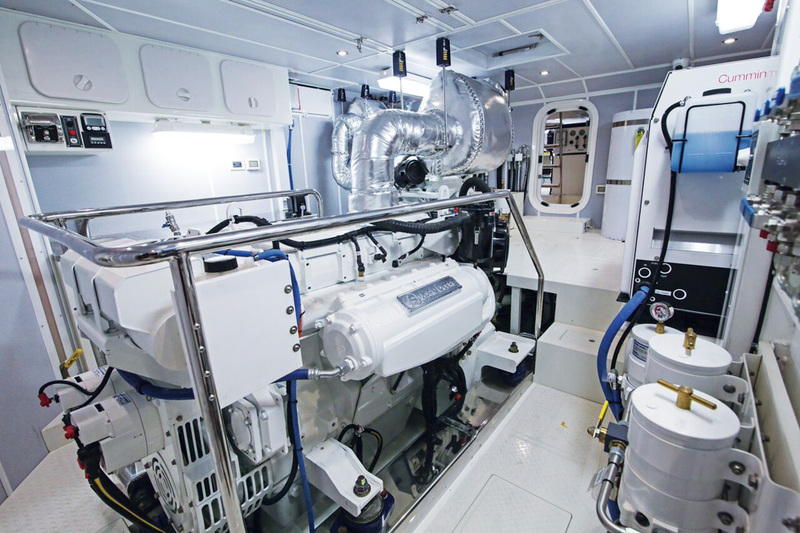 Caterpiller's smallest propulsion engine is 7 liters and 280 hp, which is just way too big. Similarly, Cummins' smallest engine is 6.7 liters and 250 hp. Yanmar has a much smaller 2.7 liter engine that operates at around 3500 rpm that puts out the right hp, but they caution about continuous full power operation. They are really meant for lighter duty applications. Someone asked about a "baby Scania', but the smallest Scania is a 5 cylinder, 9 liter engine, and it's not Tier 3 certified. The bottom line is that there really isn't much choice. But only having the Deere isn't a bad thing because it's a really good engine. The 4045 (4.5 liters) has been around for a very long time and has an excellent reputation, so I'm very happy with this engine. 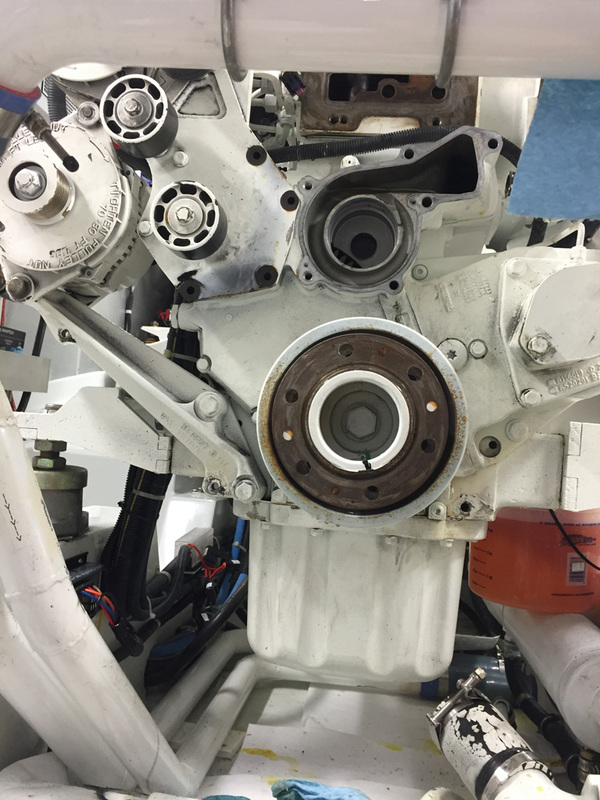 It's continuous duty rated (M1) producing 160 hp at 2300 rpm. I'm told it will move the boat at about 6 kts which is excellent for a wing engine. Absent from the list is Caterpillar. They just don't have an offering in this power range and duty rating. Also absent is Lugger, but they have been absent for a number of years after exiting the propulsion engine business a number of years ago. 1) Out through the cooling system and into the surrounding sea water, either through a heat exchanger or a keel cooler. This is where 90% of the heat goes. 2) Out the exhaust pipe in the hot exhaust gas. 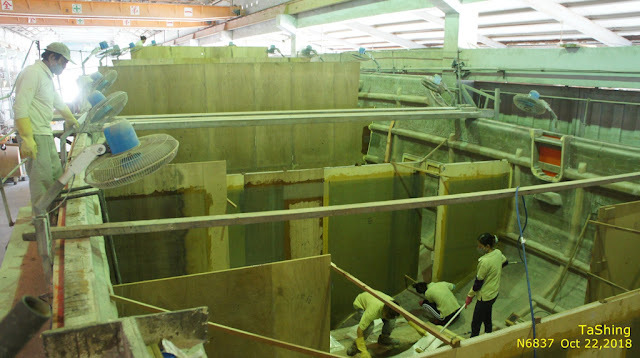 3) Radiated into the surrounding environment, in our case the engine room. 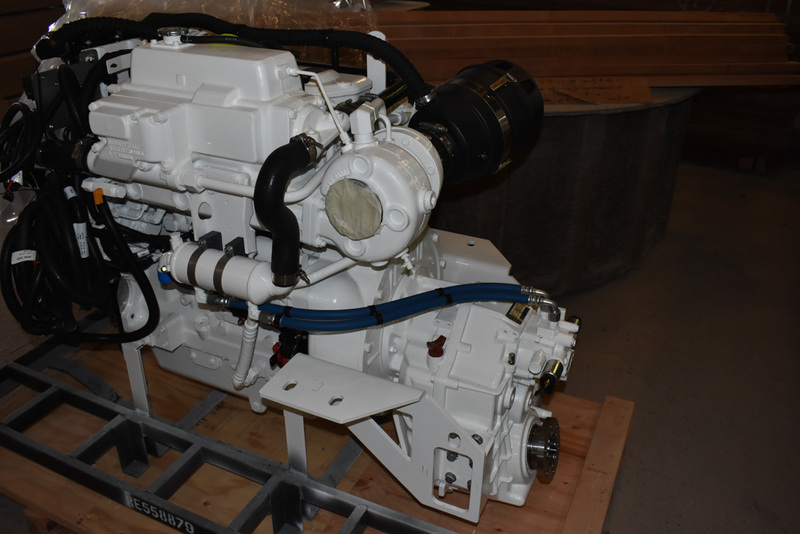 Whatever heat doesn't go out one path, must go out another, and when it comes to engine room cooling, #3 is what we care about, and these three engines have radically different performance in this respect. The Scania dumps a freakishly small amount of heat into the engine room. 14kw, to be exact. In contrast, the Cummins dumps 23kw which is more normal, but still nearly twice the Scania. Then the Deere dumps a whopping 40kw, which is freakishly large, and almost three times the Scania. The result is a huge difference in the back flips required to vent the space, and the resulting temperature rise in the ER. This alone was probably the dominant factor in the ranking. Beyond this, each engine had characteristics that bumped it up a little, or bumped it down a little in the ranking. It ended up being a very close call between Scania and Cummins, with Deere a distinct third. Here's some random narrative on each. Scania has very little presence in the US, but is a huge, $12B Swedish company. 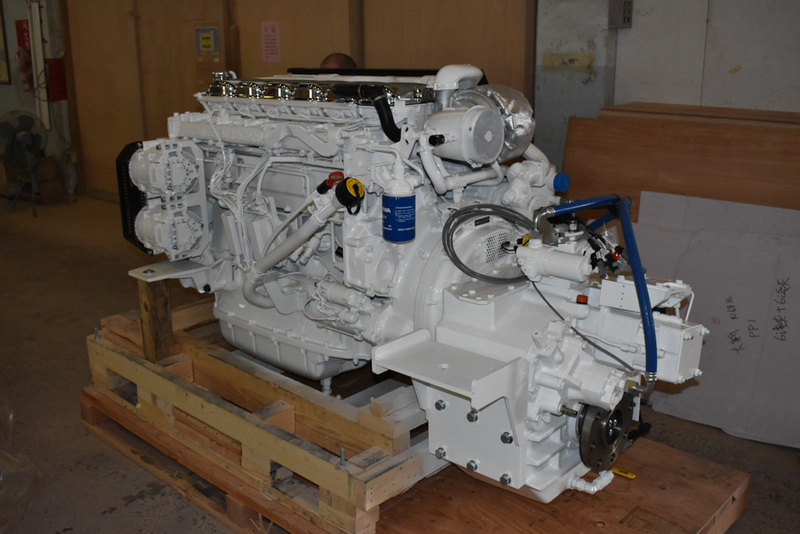 They primarily build and sell trucks and buses, but build their own engines and have a separate business selling those engines into marine and other industrial application, much like Caterpillar and Deere. And as of a few years ago, they became part of Volkswagon AG. I have always favored Swedish engineering. Older Volvos, Electrolux vacuums, Husqvarna chain saws are all brilliant in their simplicity, effectiveness, longevity, and serviceability. Scania trucks and buses have a similar reputation, and that carries into the marine engines. 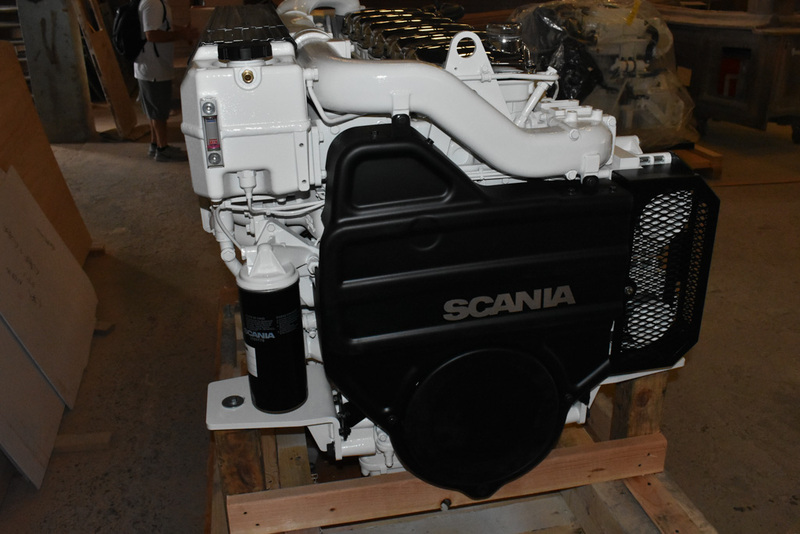 I spoke with a number of distributors, dealers, and owners of Scania marine engine powered equipment, and not a single one had anything but praise for the product. And all the dealers and distributors deal in other brand engines as well, so had no incentive to favor Scania over anyone else. 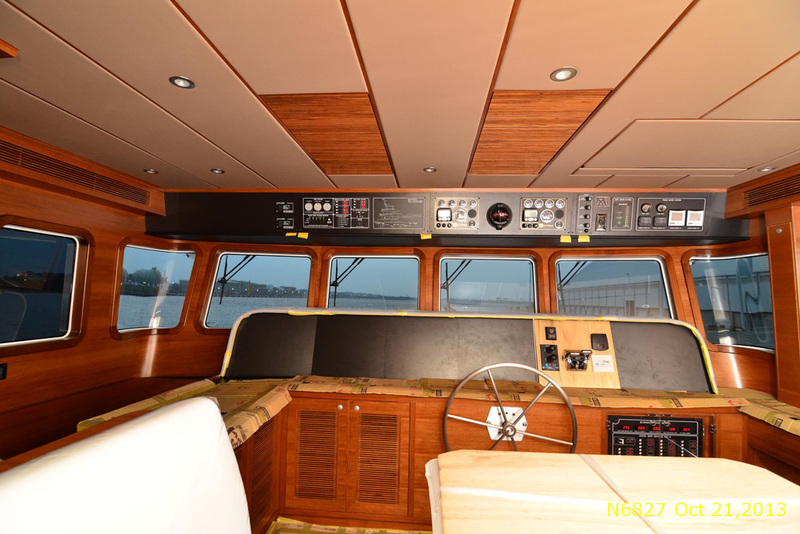 Just looking it over, it's a very well thought out design with very well integrated marine accessories. On many engines, the so-called "marinization" becomes it's Achilles heel, with heat exchangers and water pumps bolted on in ways that block service access to other parts, and creates a more complex package. The Scania is very compact and streamlined, with excellent access to all servicable parts. One thing I was concerned about was cost and availability of parts. 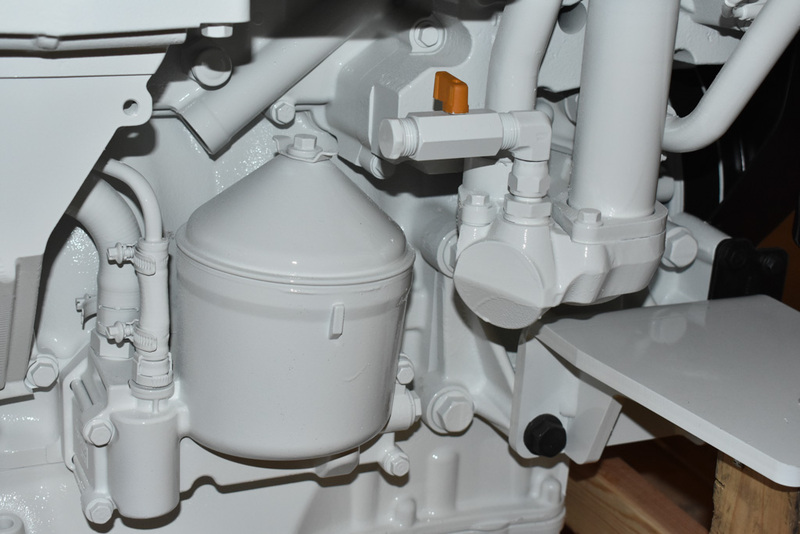 Volvo, another Swedish marine engine manufacturer, has a reputation for extremely expensive parts. I owned one a while back and found that if you imagined an incredibly high price for a part, then doubled or tripled it, you would be in the right ball park. So I made up a list of typical spares and service parts, and got a quote for price and availability. Everything on the list was available either at the dealer or a day away in a central warehouse, and prices were all in line with other vendors. So they passed that test. The product checked out with flying colors, as did parts cost and availability, but what about service. If there is any down side to Scania, that's it. Pretty much anywhere you can find a Deere or Cummins service guy, but Scania? For me, I'll be doing most if not all work on the engine myself, so in many ways access to techs is not an issue. But in the event one is required, they do have a network, including Hatton Marine in Seattle who I have used in the past. So worst case I'll be flying someone in from Hatton. But in all honesty, if I need to get someone in to help, it would likely be serious enough that I'd be flying one of their guys in anyway, so not really a problem. So I am very confident in the product, and am confident I can get parts. The one risk is Scania's longevity in the North American engine business. They have completely forfeited the North American truck and bus business, and it's not because it's a small market. They made a go of it back in the 80s, but only lasted a few years before pulling out. But really the bigger concern is the size of the engine business compared to their overall business, and the engine business's size in NA compared to their costs. 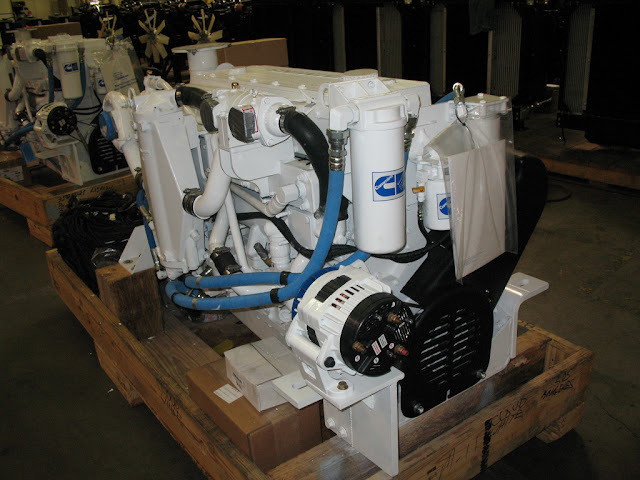 Unlike other regions where they have a large truck and bus business to carry the cost of spares and a dealer network, in NA it has to be carried entirely by the engine business. Let's look at it via the numbers. Scania reports that their world wide engine business is 1% of overall revenue. Then, when they break down the engine business by geography, North America isn't even in the pie chart, and the smallest sliver in the chart is 3%, so we know NA is less than that. So the NA engine business is less than .03% (3% of 1%) of Scania's business. This was my only hesitation with Scania, and why Cummins was such a close second. In contrast, Cummins is also a $12B company, and their whole business IS engines - 100%. Or at least very close to 100%. There's just no question where they will be tomorrow. Sounds pretty scary, right? Well, not really. There have already been two Nordhavn't built with Scania engines, all running well. And there are three of us currently building 68s with Scania engines. And of the fleet of 70 or so Scania-powered commercial boats operating in Bristol Bay, Alaska, the only reported problem is a broken oil spinner. The engine was installed with poor access and it got man-handled and broken. So I really do think we are getting a superior product. And even if Scania departs the NA market, there are plenty of ways to get parts, most of which we keep on board anyway. And if it turns out to be a total, unmitigated disaster, I can always pull it out and install a Cummins for a small cost relative to the value of the boat. So ahead we go. The Cummins candidate was the QSM11, continuous duty rated at 400hp, 1800 RPM. Most of the QSM11s out there are higher HP rated, pleasure duty engines. They have a good reputation, but a well known issue with the exhaust manifold to head joint leaks. But that issue is only in the higher output rated models, and not the commercial duty version. It's a well proven engine, with an excellent commercial duty track record. Parts and service are available on nearly every street corner, so no problem there. It was a very strong candidate, and frankly lower risk than Scania, but that was offset by the superior heat rejection of the Scania. Had Cummins had similar heat performance, I probably never would have looked further. The Deere under consideration was the 6135SFM85 which is the raw water cooled, heat exchanger version of the 6135. 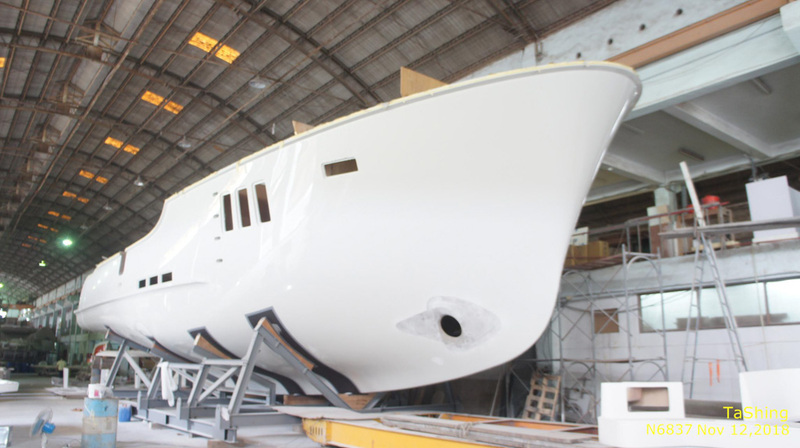 Nordhavn specs the 6135AFM85 as standard equipment, which is the keel cooled version with an M2 (16/24 hrs full power operation), 425hp at 1900 rpm rating. I wanted wet exhaust and cooling, hence the SFM version, which also has the benefit of an M1 (continuous duty) 425hp at 1800 rpm rating. It's a touch more HP than the Scania and Cummins, but not enough to make any difference. The real killer was the heat rejection. It makes for a challenging engine room venting design vs an easy and breezy one. Plus there were some pesky issues I had with the Deere 6090 on my 60 that made me less than confident in the marinization of the 6135. I think they are stellar base engines, but pesky problems can add up to a real annoyance and erode confidence in the over all package. Here are some of the issue that I encountered. 1) Excessive belt dusting and shedding. All the 6090's seem to have this issue shedding profuse amounts of dust and shrapnel. I checked alignment of all the pulleys, tension, belt wrap, belt loading, and consulted everyone and anyone I could find, and never figured it out. 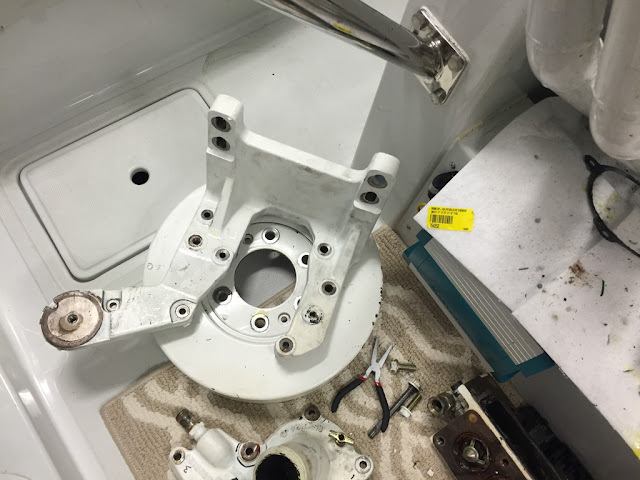 What I do know is that all the other 6090s I know of in boat service experienced the same thing. It does seem to reduce considerably somewhere in the 800-2000 hrs range, with ours finally subsiding at close to 2000 hrs. 2) Oil seepage from various engine joints and seems. I was always getting oil seeping from valve cover seems, the oil pan seem, and other joints. I just don't understand why this should be. Oil just shouldn't ooze out of an engine. 3) Turbo gasket coolant leaks. For the first couple of years I had a very slow loss of coolant, with no trace of where it was going. 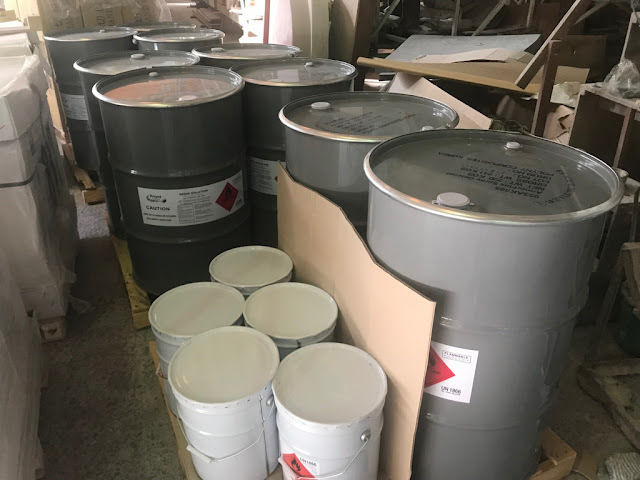 I had heard of issues on the 6090's predecessor, the 6081, where coolant would leak past the turbo gasket and disappear out the exhaust in unnoticeable quantities, other than long term. The master of all things Diesel, Bob Senter, suggested a sealing procedure on the turbo gasket, so I set about to do it. The gasket alone suggests that the joint is difficult to seal. 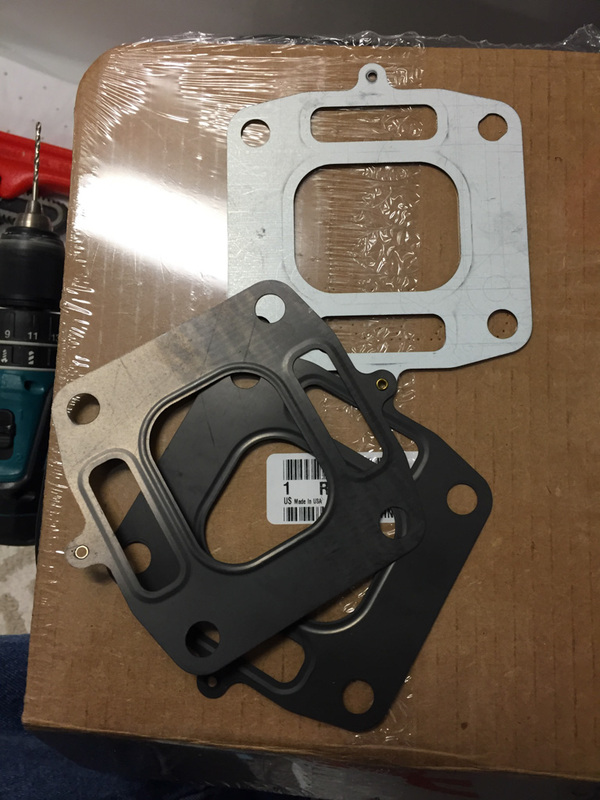 It's a layered gasket, riveted together in a sandwich. 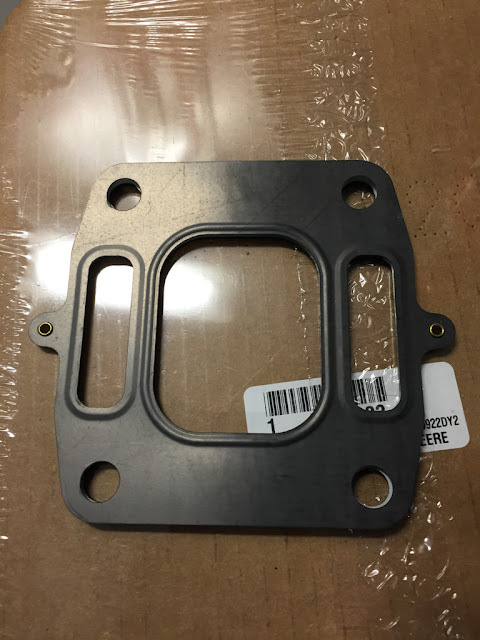 The center layer is a typical gasket material, and the two outer sandwiching layers are thin steel each with a molded in rubber seal, kind of like a built-in o-ring. 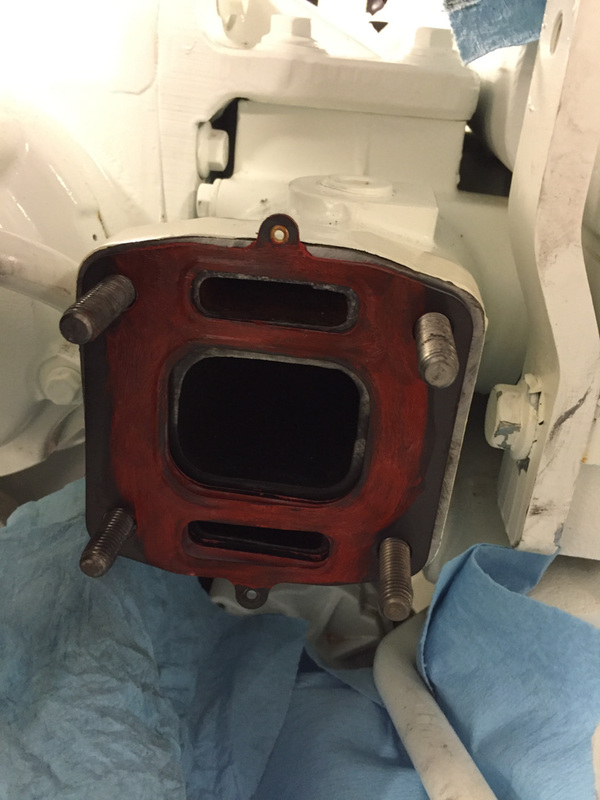 The procedure was to further seal using Permatex Red high temp sealant. I actually drilled out one of the rivets and fanned opened the layers like you would fan out a hand of cards. That allowed me to get a film of the sealant on all the mating contact surfaces, then carefully fold it back up. I put it all back together and presto, no more slow coolant leak. Problem solved, but not a confidence builder. 4) Coolant pump leak. The cooling pump, like many, has a weep hole to detect leaks. If the coolant seal is leaking, you will get cooling out of the weep hole, and if the drive side of the pump is leaking, you will get oil out of the weep hole. It's a gear driven pump off the timing gears, hence the side exposed to oil. Early in the engine's life I was getting drips of coolant from the weep hole, so the pump was replaced under warranty. That sort of thing happens, but it exposed another issue which is accessibility due to the marinization of the engine. To change the coolant pump, something that would be a couple of hours max on the tractor or industrial version of the engine, was a solid two day job for two guys. Endless amounts of stuff had to be removed from the front of the engine to gain access, all of it added as part of the marinization package. It just wasn't well thought out. Frustrating, but that was only the beginning. About 20 hrs into the new pump, and I was getting drips of coolant again. So after the season was done, I pulled it all apart again, this time doing the work myself because it seemed logical that the guys doing the first replacement had done something wrong. After I got the pump out, there was no sign of poor workmanship by the other guys, so I went to get another pump under warranty. Well, warranty only provides for a rebuilt pump, so I decided to take the rebuilt pump and keep it as a spare, and sprung for a new pump on my own dime, just in case. After two days of solid work it was all back together and ready to go. But to my horror, after about 20 hrs (same as the last two times), it was dripping again. 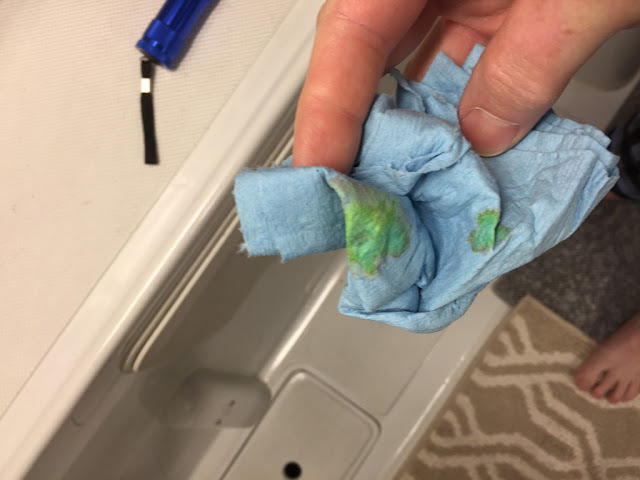 Escalation of the issue through the distributor to Deere just went in circles and kept pointing back to an inapplicable tech bulletin that had the words "coolant pump" in it. I finally gave up and decide to just live with it, like the oil seeps. I went for well over a thousand hours and it never changed or progressed, so I just kept on going. There was no way I was going to tear the front of the engine apart again unless someone had a very convincing explanation for the problem, and an equally convincing solution, and nobody ever did. So the engine never missed a beat in 2000 hours, but these little things bugged me the whole time, and made me less than thrilled about another Deere engine. There you have it. Scania is the fairest of them all. We are making a variety of changes to the "standard" N68, though that's kind of a meaningless statement since there really is no "standard". The running joke is that if you've seen one Nordhavn, you've seen one Nordhavn. They are all different, and that's one of the key features of the brand and company, at least for us. 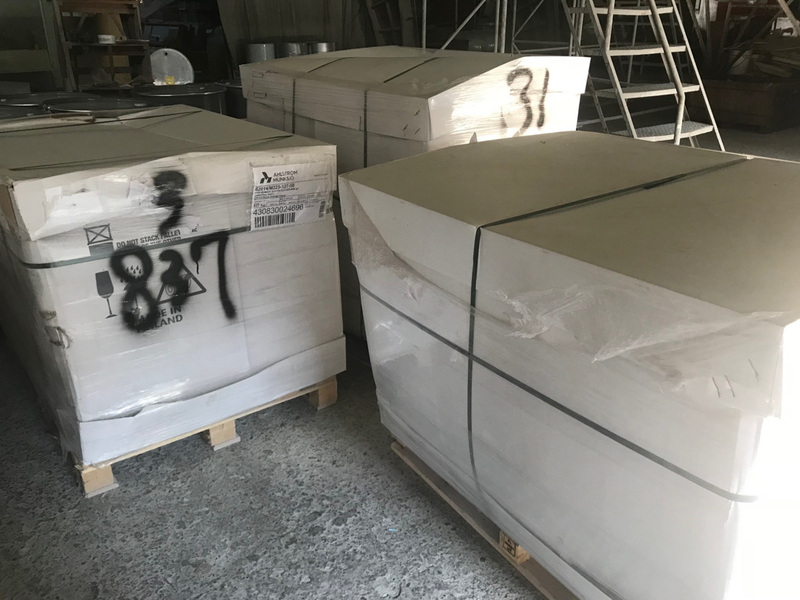 This post will focus on some of the more noteworthy changes that we are making. It will be interesting to see which, if any, find their way into the "standard" boat over time. 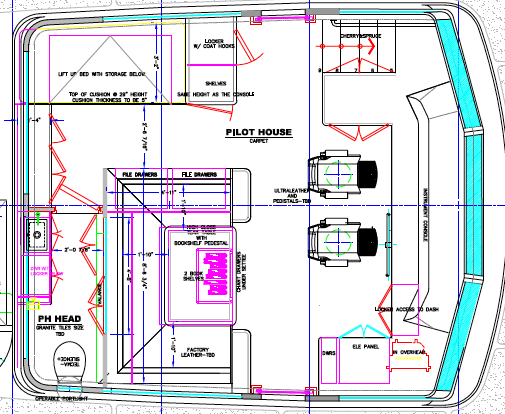 We can start in the pilot house where we are making some changes to the windows, building on some work done by previous buyers, and adding a few things that are important to us. The picture below highlights one aspect of the windows that we have found problematic. You can see the side window on the left, and what might not be obvious is that the corner rounding from the front windows to the side windows is done with curved glass. It looks kind of cool, but on our N60 we found the distortion associated with the curved glass to be quite objectionable. 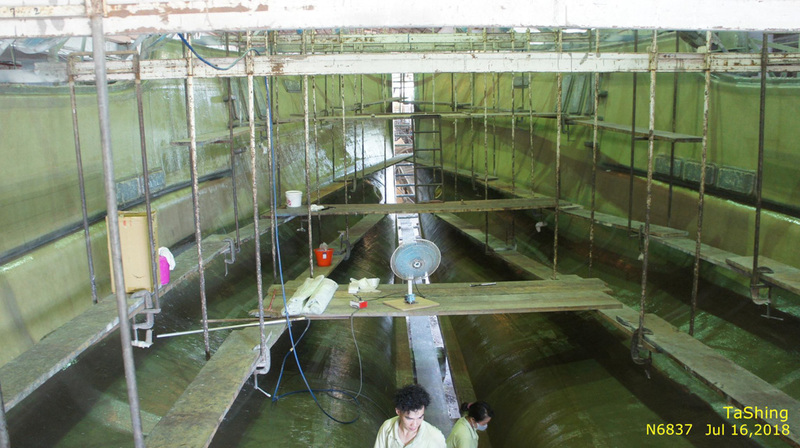 One essential goal for us building a new boat was to eliminated that issue. To address this, and to generally open up visibility, we are moving the window mullions out to the corner, and the mullions will form the curved corner rather than glass. 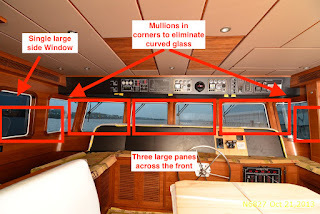 Then the glass will be flat on both sides, eliminating any distortion. Then at the same time, we are switching to fewer, larger panes of glass. Instead of 8 panes across the front and around the sides, we will have five as show in the sketch below. Several boats before us took the step of merging the two center windows into one larger window, and we are continuing with that theme. The last change to the pilot house windows is to raise their top edge by about 2". For whatever reason, the top of the pilot house windows on the 68 are lower than on the 60 and on the 76. I'm tall, and found myself needing to crouch to see out to the horizon on the 68. Increasing the height of the windows by 2" will make all the difference in the world. 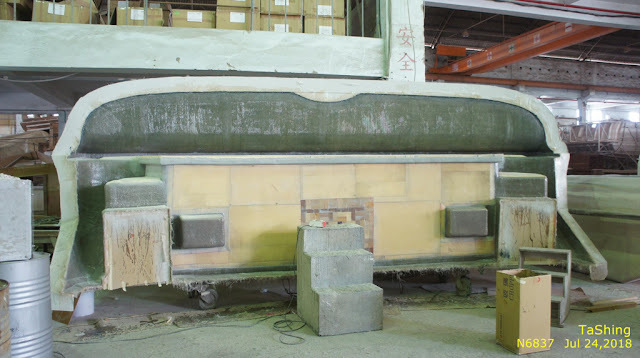 Here is the mold, with plugs blocking out the windows in their new locations. Sticking with the pilot house and visibility, we similarly enlarged the windows all the way around, and sorted out a layout that provides nearly 360 degree visibility. In the drawing below, the blue indicates where there is glass, and you can see there are only a few, relatively narrow lines of visibility that are blocked. And while on the layout, one other thing is worth noting. Normally the jump bed is behind the settee, and the head is in the port aft corner. We basically swapped the location of the two. Having the jump bed behind the settee makes access to the space under the bed, and under the settee very difficult. And it's a LOT of space. By swapping their locations, we can now have doors in the head providing access to the space under the settee, making that very accessible. And the jump bed can lift up with easy access to the space below without having to climb over the settee and reach down what is probably 4 feet. Moving down to the salon, our window theme continues to show through (pun intended). 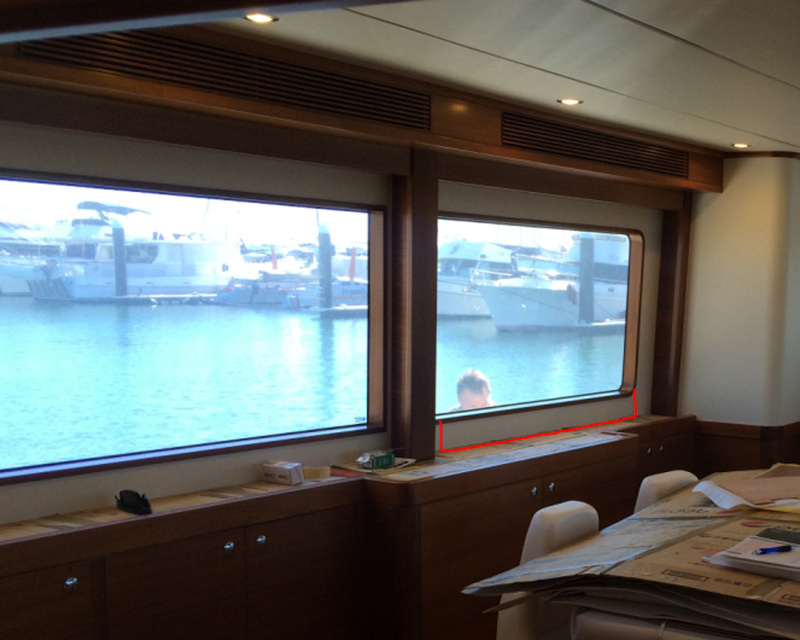 One very annoying "feature" of the 60 is that when seated in the salon, you can't see the horizon through the windows. The lower edge of the windows was too high. So you find yourself in a beautiful location, and all you can see are the hillsides and sky. 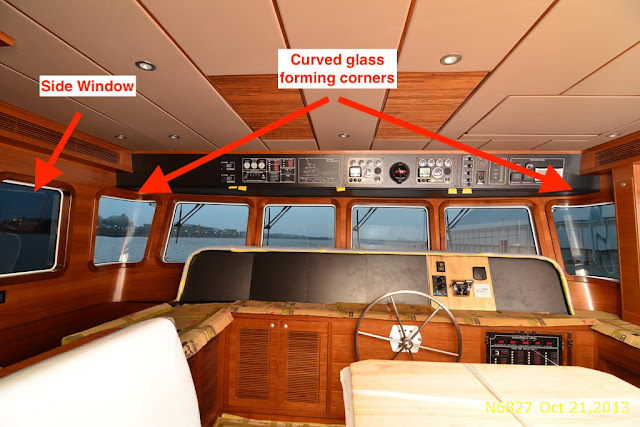 I checked this carefully on other 68s and found that the windows are lower, which was good, but we were able to lower them even further to improve the view even more. 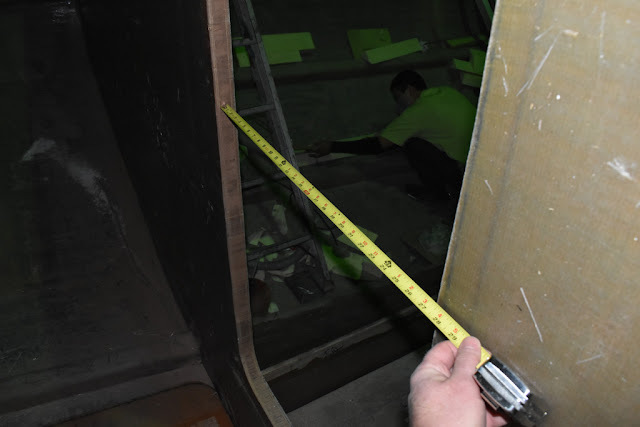 The picture below shows the typical windows, and the red line shows how we are lowering them such that the lower window frame will be flush with the counter/ledge, picking up about 2-3" more visibility. 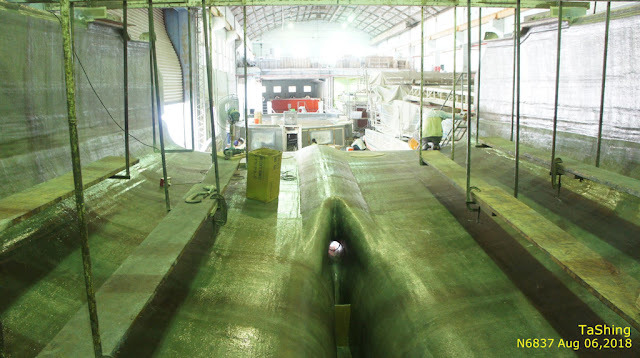 Moving down a level, the lower hallway leads to the engine room, and the picture below shows the engine room door. The door is 18" wide, and when open, the locking wheel stands out narrowing the passage a bit more. I found it to be a pretty tight squeeze so asked about widening it. Jeff Leishman worked his magic and managed to widen the hallway and fit a 24" door, all with no ill effect on the adjacent staterooms. 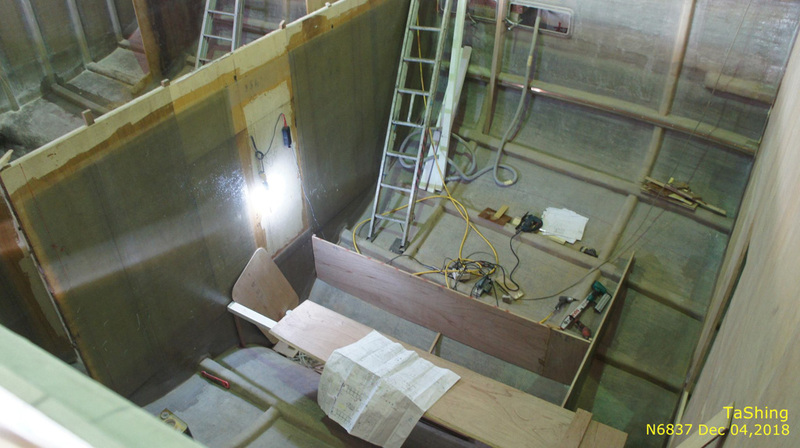 In the next picture down I'm confirming the rough opening in the bulkhead. Next is a feature that will either be a stroke of brilliance, and an utter failure, with very little room in between. 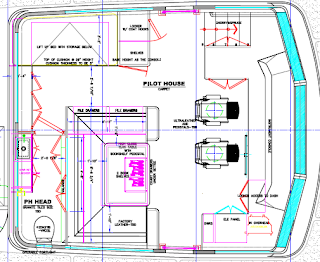 Our 68 is the aft pilot house version, and that means that the boat deck is in the bow. That creates some complications when it comes to launching and retrieving a tender. When you launch the tender, you end up on the forward deck and the tender ends up in the water 10 feet below you, with no way to get to it. And similarly on retrieval, you bring the tender up to the davit line and get it connected, then somehow need to get back up on deck. 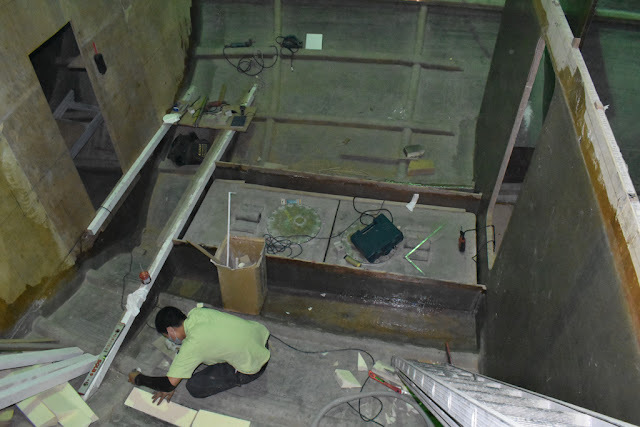 The standard solution is a removable ladder that hangs down the side of the hull providing a path between the tender and boat deck. It works, but nobody seems happy with it. The ladder is awkward the handle and difficult to hang over the side and get connected, and difficult to reverse the process. Plus it's difficult to store. A friend has never used his, and instead had mastered a way to scale the outside of the hull like Spiderman, using a sequence of the rub rail, a window ledge, and the high sides on his large tender. I liked that idea, but with our window arrangement it wouldn't quite work, with "steps" of 30" or more which is too much. 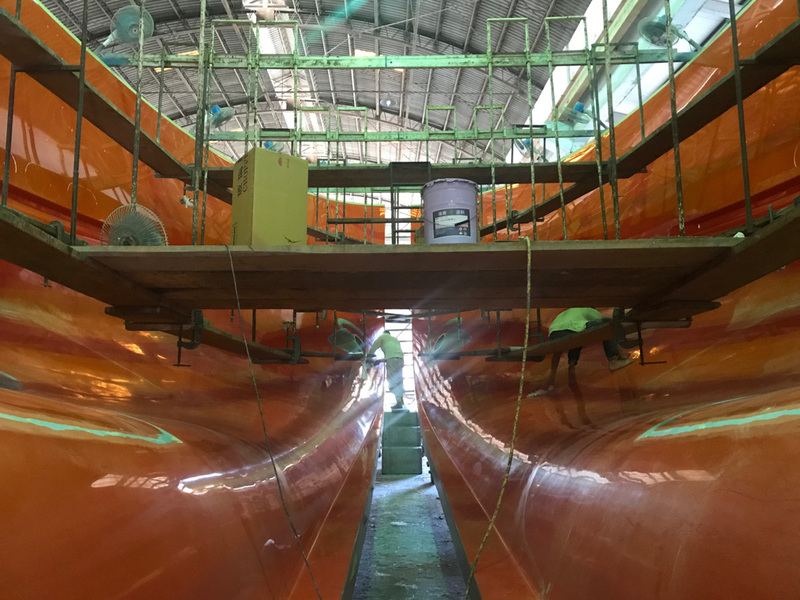 Then I got this crazy idea about just building the ladder right into the boat. 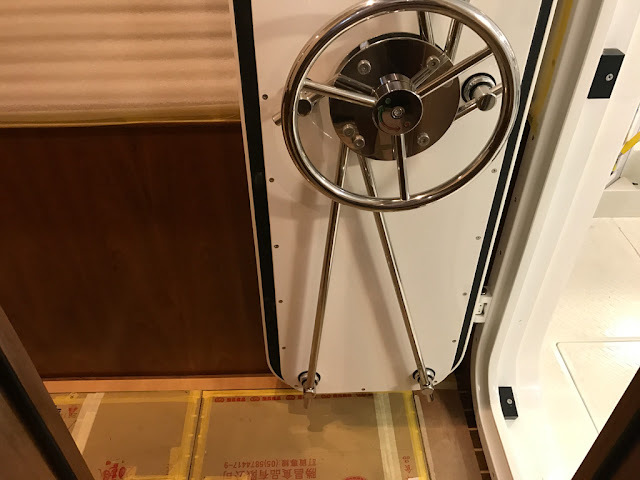 The side boarding gate has a molded in toe pocket/step, and I thought why not do the same in the bow. 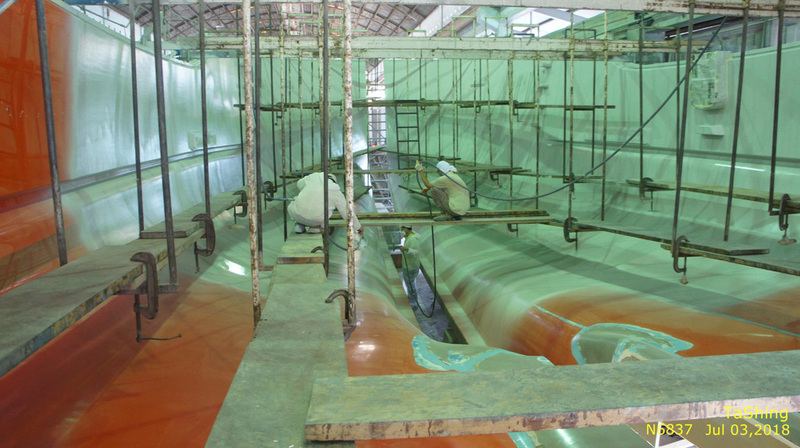 The result can be seen below with a set of four toe pockets/steps molded into the hull. Everyone who's seen it thinks it will work, and the only trick will be where to locate one or more grab handles. 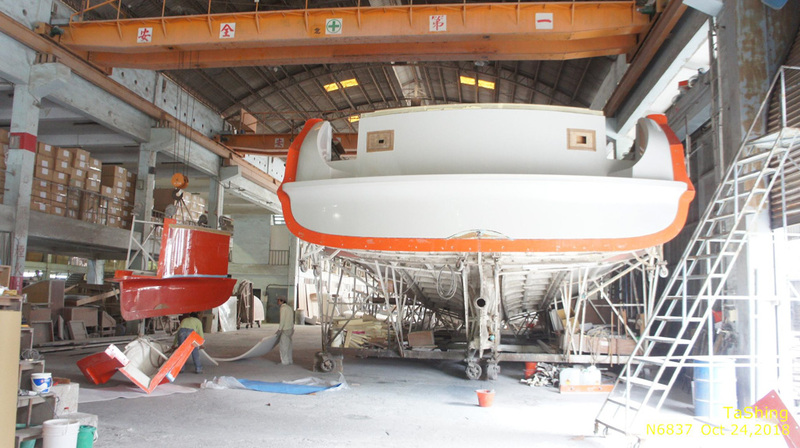 I've just complete my first visit to Ta Shing Yacht Builders in Tainan, Taiwan. I'll spare the travelog, and just say I really like Taiwan, and Ta Shing's hospitality is second to none. Thank you Ta Shing!! 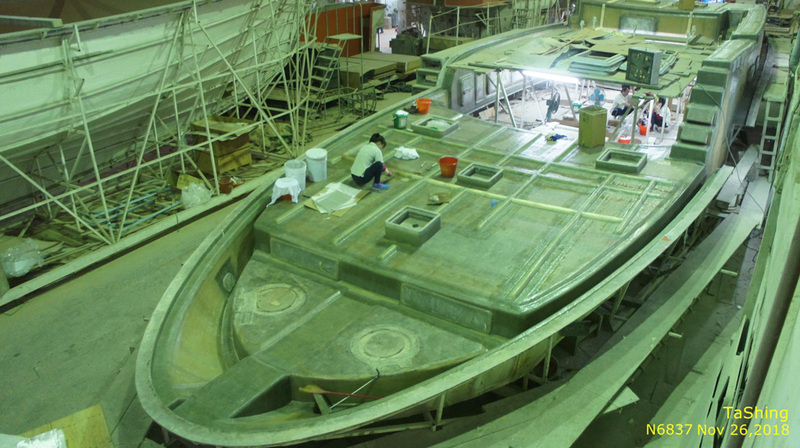 Progress continues molding other parts of the boat. The hull that we followed in the last blog entry covered the creation of the hull, but that's just the beginning of the structural components. 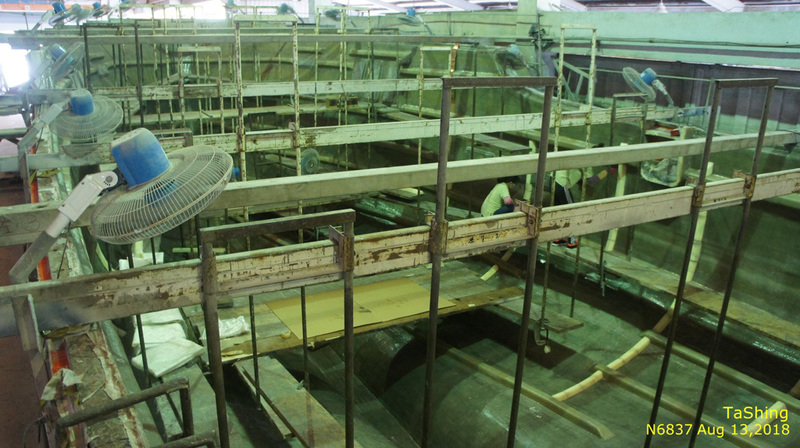 Next up is the main deck, and the pictures below show the mold being prepared. It's upside down, so a bit confusing to look at. In the picture immediately below, the section that the guy is standing on is the cockpit. He's standing on the floor, but on the underside. To the right is the salon, so all of what you see are the salon walls and the walkway around to the forward deck. Next below is the fore deck, and is all part of the same mold. 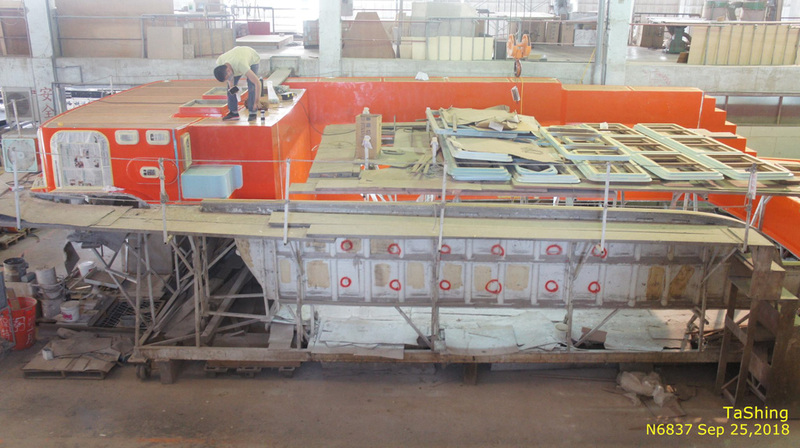 The boxes standing up are the openings for the overhead hatches, and the two round outlines forward are the openings for the Freeman hatches to access the chain locker. 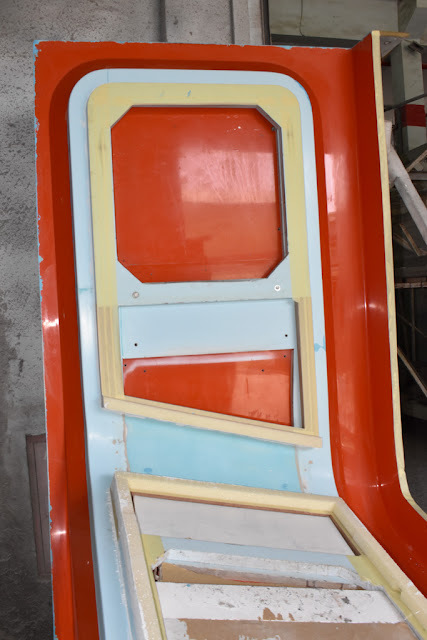 Fast forward, and below you can see the same mold, now laminated with gobs of fiberglass, and stiffener being laminated in. 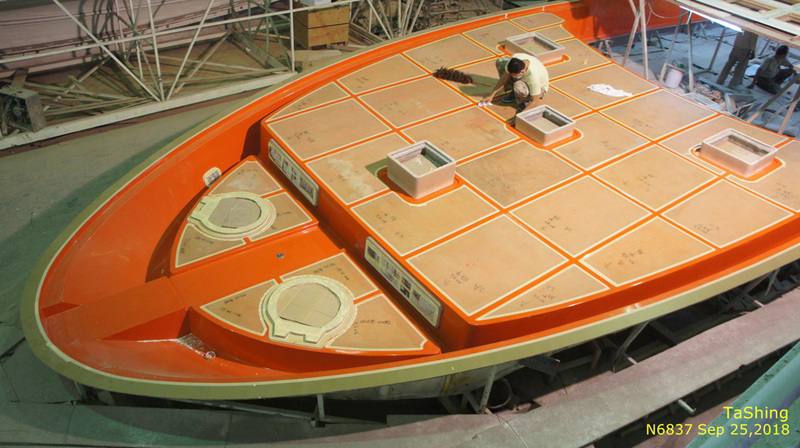 Meanwhile, things are progressing in the main hull. The plywood partitions form the compartment where the black and gray water tanks will live. Over the days I was at the yard, the tanks got placed, and additional stringers are being laminated in to form the base for the floor in this area. The main engine is a Scania DI-13 80M. It's a 6 cylinder, 13 liter engine rated at 400hp (295kw) at 1800 rpm, continuous duty. The gear is a Twin Disc MGX-5114-DC with a 3.43:1 gear reduction. One nice feature of the Scania is that it supports 500 hr oil change intervals, in part because of the built in oil centrifuge. One of our options for the engine is a dual alternator configuration using large frame, pad-mounted Leese Neville alternators. Each alternator can produce 200A at 24V.